Here is a picture of the new leadership team at the Haitian Senate with Ronald Larèche as Senate president, Steven Benoit as Vice President, Jean-Marie Salomon, second secretary and Francois Lucas Sainvil remaining first secretary. 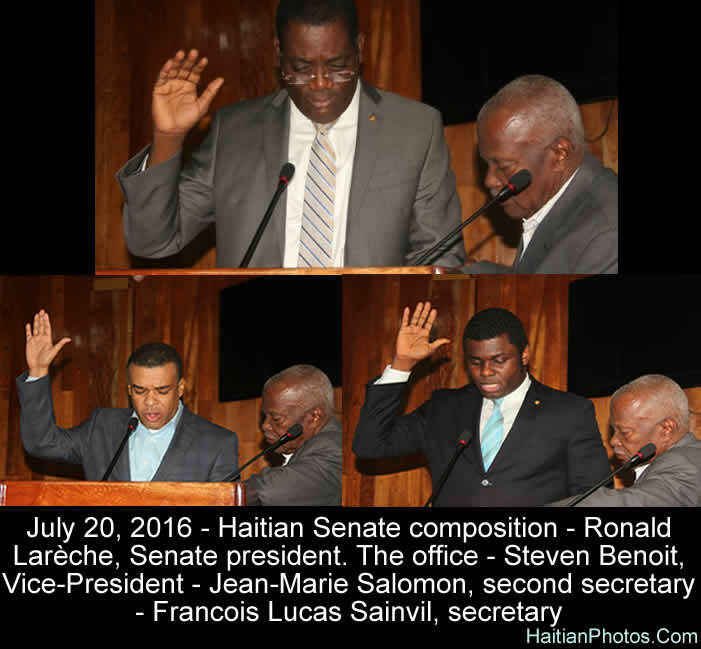 On Wednesday, July 20, 2016, Ronald Larèche, the former vice president of the Senate, has been elected the president of the Haitian Senate. After the withdrawal of Andris Riché from the run he was the only candidate and elected as the president of the Upper House unanimously with 16- 0 votes. Since the former chief of the Senate Jocelerme Privert was installed as the Provisional President of Haiti, in last February, Haitian Senate has run without an elected president, the position was held by Larèche on an interim basis. Ronald Lareche is a former Senator of the North East; by profession, he is a lawyer and a member of the Parliamentary Group of the Renewal (GPR) Commissions and member of several high profile committees such as, Committee on Foreign Affairs, Worship and Haitians living abroad, Committee on Interior and Local government, Decentralization and Border Development. He is also a member of the Commission for Justice and Public Safety.